Whether your financial setback is a result of illness, a job loss, failure to budget, or something else entirely, it can be incredibly difficult to try to temporarily juggle your bills without sustaining credit damage. In truth, it is best to try to plan a budget, cut spending, and create an emergency fund in order to avoid these bill-juggling scenarios altogether. If you find yourself routinely delaying payments because you have more bills than money, you are teetering on the edge of a dangerous cliff. You do not want to put yourself in the position of being just one misstep away from a financial and credit disaster. Nonetheless, it is still worth knowing just how late a late payment can be before it hurts your credit. It is smart to be concerned about late payments and how they could impact your credit scores. Your payment history accounts for 35% of your FICO credit scores. The good news is that not every late payment is going to automatically harm your credit scores. In order for a late payment to negatively impact your credit scores it must first be reported to the credit bureaus. 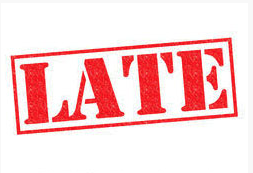 If a late payment does not actually show up on your credit reports then it cannot have any negative impact upon your scores. So at what point does a late payment get added to your reports? The answer is…it depends. First, it is important to understand how the credit reporting of late payments actually works. Credit reporting is voluntary, so it is up to a creditor to choose when (to a certain extent) and if they will report late payments to the credit bureaus. If a creditor chooses to report late payments to the credit bureaus, they are not allowed to do so until you are a full 30 days past the due date. Since creditors are not allowed to report late payments to the credit bureaus until you are at least 30 days past due, it should not hurt your credit scores if your payment is a few days or even a few weeks late. Your lender may charge you a late fee for being even one day past the due date, depending upon your agreement, but your credit should not be impacted negatively yet. Some lenders, such as many student loan providers, may opt not to report a late payment to the credit bureaus until you are 60 or even 90 days past due. Of course, even though credit reporting is voluntary, many creditors do choose to report late payments at the 30-day-past-due mark. An exception to this rule, however, is creditors who do not generally report to the credit bureaus at all. Some examples of these might include service providers such as your electricity provider, your mobile phone provider, your cable internet provider, etc. A late payment on one of these types of accounts typically will not show up on your credit, as long as you become current again and do not go into default. Remember, the best course of action is to avoid late payments entirely, even if you need to cut spending in order to do so. However, you can rest a little easier knowing that you at least have a bit of a grace period when it comes to credit reporting if an unforeseen financial emergency arises. CLICK HERE or call 214-856-0068 to schedule your no-obligation credit analysis with Financial Renovation Solutions today.